1 A None No Power Seat 1 A is a standard Club Europe seat that may have restricted legroom due to the bulkhead. The tray table is in the armrest, making the armrest immovable and slightly reducing the seat width. There is no overhead or floor storage for this seat during takeoff and landing. The proximity to the galley may be bothersome. 1 B None No Power Seat 1 B is a standard Club Europe seat that may have restricted legroom due to the bulkhead. The tray table is in the armrest, making the armrest immovable and slightly reducing the seat width. There is no overhead or floor storage for this seat during takeoff and landing. The proximity to the galley may be bothersome. 11 A None No Power Seat 11 A does not recline due to the exit row behind. 11 B None No Power Seat 11 B does not recline due to the exit row behind. 11 C None No Power Seat 11 C does not recline due to the exit row behind. 11 D None No Power Seat 11 D does not recline due to the exit row behind. 12 A None No Power Seat 12 A has extra legroom due to the exit row. 12 B None No Power Seat 12 B has extra legroom due to the exit row. 12 C None No Power Seat 12 C has extra legroom due to the exit row. 12 D None No Power Seat 12 D has extra legroom due to the exit row. 2 C None No Power Seat 2 C is a Club Europe seat that has extra legroom due to the position of the Bulkhead. The tray table is in the armrest, making the armrest immovable and slightly reducing the seat width. 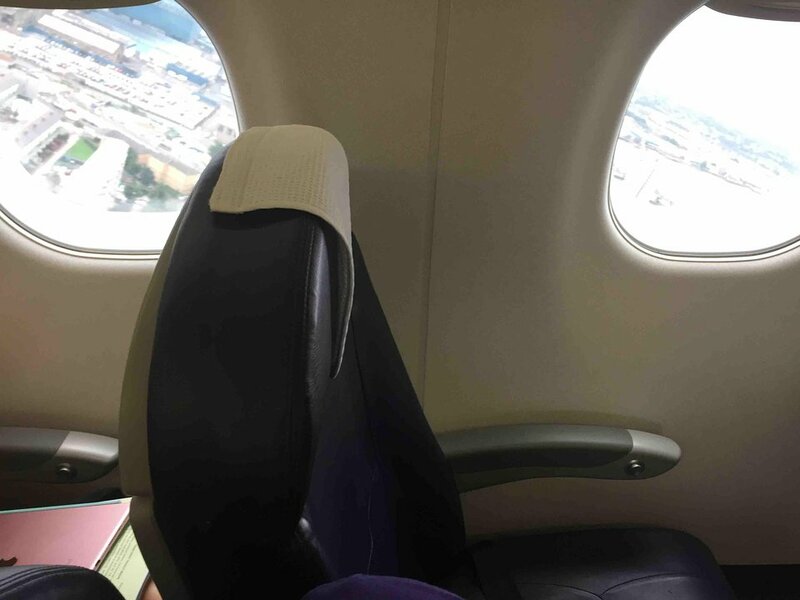 There is no overhead or floor storage for this seat during takeoff and landing. The close proximity to the galleys and lavatory may be bothersome. 2 D None No Power Seat 2 D is a Club Europe seat that has extra legroom due to the position of the Bulkhead. The tray table is in the armrest, making the armrest immovable and slightly reducing the seat width. There is no overhead or floor storage for this seat during takeoff and landing. The close proximity to the galleys and lavatory may be bothersome. 23 D None No Power Seat 23 D is a standard Euro Traveller seat. 25 A None No Power Seat 25 A is a standard Euro Traveller seat in the last row of this aircraft. The proximity to the lavatory and galley may be bothersome. 25 B None No Power Seat 25 B is a standard Euro Traveller seat in the last row of this aircraft. The proximity to the lavatory and galley may be bothersome. 25 C None No Power Seat 25 C is a standard Euro Traveller seat in the last row of this aircraft. The proximity to the lavatory and galley may be bothersome. 25 D None No Power Seat 25 D is a standard Euro Traveller seat in the last row of this aircraft. The proximity to the lavatory and galley may be bothersome. 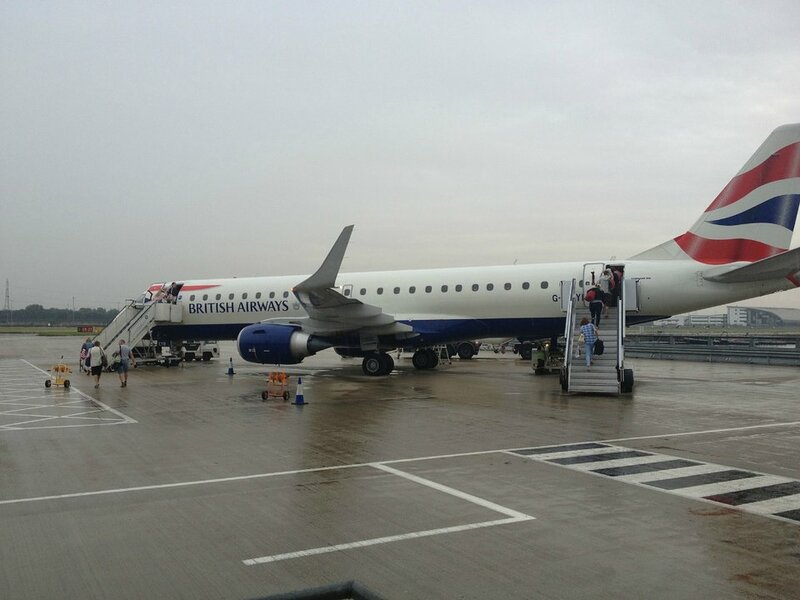 British Airways' subsidiary, CityFlyer, flies the Embraer 190 European from London City airport to other destinations across Europe. British Airways has seven Embraer 190s in its fleet. The aircraft seats a total of 98 passengers. I've just returned from a trip from Australia to Europe and flown on A388 and B789 aircraft, as well as this flight from LCY to ZRH. Nothing fancy about this seat, but it was by far the most comfortable and spacious of all my flights. These are by far the best seats in the house. More legroom and space. Add to the security and safety aspect of the seat location it's ideal. However all Embrear planes are more like executive business planes as the seating is 2x2 with a wide aisle and usually leather seats. Never, ever been on a short haul flight with so much legroom, so much so that I took a photo of the gap between my knees and the seat in front. Could of had a little party in the gap. Food and drink too, smashing. Flew from LCY to Skiathos. Whilst the window was not ideally positioned, the leg room was superb (I'm 5'10"). However, this really wasn't a big deal as the flight was only approx 60% full, so I just sat in another seat that offered a better view out of the window ! Also, BA Cityflyer still providing in flight food and beverages, including wine, which was very good indeed. Overall, an excellent experience. Seat sold as a Club Europe class seat, but was no different to the seats in economy. Not worth traveling Club Europe or paying the extra fare out of London City. BA Club Europe seats stop at row 6 on flights into LCY. But the good news is that on flight in and out of LCY you get fed and watered. The seats on this flight were exstreamly comfortable and large. While I agree that seats 2C,D have excellent leg room, there is no stowage in the overhead lockers as it is full of equipment and also crew bags. We had to stow our small rucksacks over seat 2A,B. If we, like the other Club Europe passengers had large carryons, there would have been nowhere to stow them. Quite incredulous that over row 1A,B and 2C,D, it is full of equipment and crew bags. No regard for the Club Europe customers. You have to be quick if you have a roller bag!! On the return flight, Malaga-Manchester, 2C&D, had been pre-allocated, it transpired, for (one) Silver BAEC member so I bagged 1A&B for us when online check-in opened. These also had extra legroom and at 6'4" tall it was still more than ample though not as great at 2C&D. The advantage is being the very first to be served from the galley. We had seats 2C&D on the ever direct BA flight Manchester-Malaga based on the recommendation of the comments here. The legroom for 2C&D is so great that if you had a pouffe you could lie flat! Reaching the seat pocket on the bulkhead was only possible by standing up. We flew from malaga to city airport and were extremly impressed in the euro travelor product. Loads of legroom a small meal which was VERY nice and filling. Overall extemly impessed and i definatly recomend!!!! Very comfortable wide seat with generous legroom.We had a good experience from Madrid to London City Airport last Wednesday. I regularly fly the 190, Palma, and occasionally when it is not a 170 to Edinburgh.1 D is the best seat on the aircraft. The legroom is more than I can stretch to (I am 6' 1") and you can get up without disturbing the person in the isle seat. The proximity to the toilet is not a problem and anyway you are served first on a short flight! On ba.com, when you check in, it shows row 25 as an exit row. This is not the case, I was deceived into believing that this was an exit row and it is not. 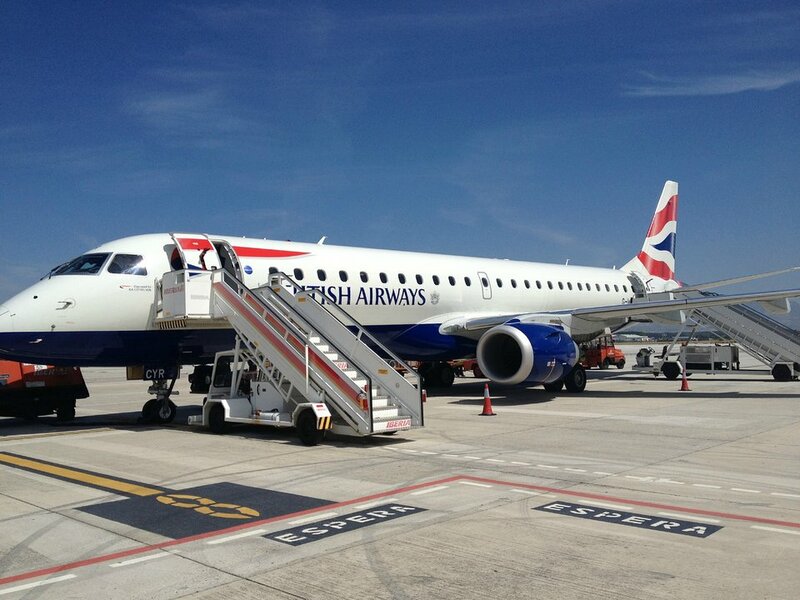 British Airways flies 2 versions of Embraer 190.